Colorado Violation Of Protection Orders Cases -18-6-803.5. The Why and The How - Denver Criminal Attorney Specializing in Domestic Violence Cases - Colorado Criminal Defense Lawyer. Colorado Violation Of Protection Orders Cases -18-6-803.5. 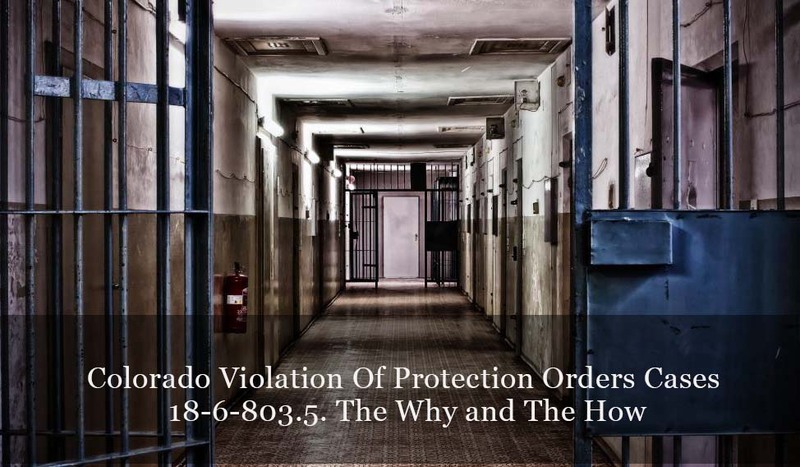 The Why and The How If you are charged with violation of a Colorado protection order sometimes called a VPO – the consequences of a conviction for this crime can be serious. When a restraining order is imposed on you – whether it be imposed in a criminal case or is obtained by a protected party civilly – a violation of that order is a criminal act. First What IS A Protection Order? “Protection order” means any order that prohibits the restrained person from contacting, harassing, injuring, intimidating, molesting, threatening, or touching any protected person or protected animal, or from entering or remaining on premises, or from coming within a specified distance of a protected person or protected animal or premises or any other provision to protect the protected person or protected animal from imminent danger to life or health, that is issued by a court of this state or a municipal court. A conviction for the violation of a civil case based protection order is a Class TWO (2) Misdemeanor – Penalty can be up to a 1 year in jail and/or a $1,000.00 fine. Unlike other types of Colorado criminal convictions – if you are convicted of a violation of a criminal protection order – your sentence is mandated under law that it must served consecutively (it will follow and can not be run concurrently) to the sentence in the underlying case – that is – the case from which the restraining order originated. Furthermore, if the criminal case, such as a domestic violence case that has not yet gone to trial – has not yet been resolved – under these circumstances (that is the restraining order is a condition of your bond) the DA / prosecutor can also charge another crime – that is the criminal charge of violation of bail bond. One of the most unjust aspects of the criminal justice system in this area – is that it is very, very easy to violate “no contact” restraining orders. When the “protected party” of a restraining order (usually a woman – but it could be either gender) calls their significant other to come over after a no-contact order is in effect – she will not be charged as an aider and abettor.. The law provides no mechanism for prosecuting this kind of subterfuge. The real tragic circumstance is where the parties have reconciled, no further abuse has occurred, and the man is still charged with a violation of a restraining order long since forgotten. Under current law, the crime of a Violation of a Colorado protection Order places all of the focus on the aleged abuser’s role in the violation and ignores the role of the so called “protected party.” The protected party’s role in the violation of a protection order will not be considered, even in cases of mutual abuse, – placing all the blame on the Defendant who is charged with the violation of the order. Intentional ignorance of the “protected party’s” role in a case of a violation of a protection order permits the alleged victim to use a protection order as a weapon rather than for protection as it was intended. If the “protected person” tries to contact you – do NOT engage or respond. If the protected party emails or texts you – do NOT reply – but save proof of the communication as evidence that can later be used in Court. If the protected party calls you – do NOT answer – and if they leave a voicemail message, save it. Finally, if the protected party comes to your location – leave and locate witnesses who could testify later to the contact. Until the law is changed in Colorado to better reflect reality- you must comply with the most restrictive terms of a Colorado restraining order and you cannot mutually agree with the protected party to jointly ignore the restraining order. If you want to -or need to – modify or drop a Colorado restraining order, there is a mechanism to do that – (see below). Until it is modified you MUST comply with every condition of that restraining order. How Does the DA / Prosecutor PROVE A Violation Of A Colorado Protection Order? 6. the defendant’s conduct was prohibited by the protection order. How Can I Defend Myself If I Am Charged With Violating A Colorado Protection Order Charge ? A Defendant cannot be prosecuted if he or she did not know of the protection order. One cannot “knowingly” violate a protection order they did not existed. A restraining order must be properly “served” on a person before the terms of that order bind that person. The credibility of the accuser is always at issue in these cases. In the absence of other evidence (another witness – video etc) a defendant may be able to show a report of a violation of a Colorado protection order is a lie and that lie was motivated by an animus of the alleged victim arising out of jealously – revenge – or – for example – a child custody battel. To prove a violation of a Colorado Protection Order – the accused must have the ability to follow the Court’s order. If the restraining order cannot be followed – that is – the order is too restrictive – this may provide another basis to defend the charge An example would be to avoid a road that the accused MUST CROSS everyday to get to work. First – If you need or want information about lifting restraining orders in Colorado – Here is a LINK to another article that might assist you. Next – Colorado civil protection orders – unlike criminal case based protection orders – do not expire. If the parties to a relationship want to reconcile – they must follow the law and file the proper Motion with the Court. Only if the Court GRANTS the Motion to remove the order can the parties legally reunite. (II) Failing to timely file a receipt or written statement with the court as described in section 13-14-105.5(9), C.R.S., or in section 18-1-1001(9) (i) or 18-6-801(8) (i). (a) “Protected person” means the person or persons identified in the protection order as the person or persons for whose benefit the protection order was issued. (D) Any other order of a court that prohibits a person from contacting, harassing, injuring, intimidating, molesting, threatening, or touching any person, or from entering or remaining on premises, or from coming within a specified distance of a protected person or premises. (II) For purposes of this section only, “protection order” includes any order that amends, modifies, supplements, or supersedes the initial protection order. “Protection order” also includes any restraining order entered prior to July 1, 2003, and any foreign protection order as defined in section 13-14-110, C.R.S. (b) “Registry” means the computerized information system created in section 18-6-803.7 or the national crime information center created pursuant to 28 U.S.C. sec. 534. (c) “Restrained person” means the person identified in the order as the person prohibited from doing the specified act or acts. (2) (a) Violation of a protection order is a class 2 misdemeanor; except that, if the restrained person has previously been convicted of violating this section or a former version of this section or an analogous municipal ordinance, or if the protection order is issued pursuant to section 18-1-1001, the violation is a class 1 misdemeanor. (a.5) A second or subsequent violation of a protection order is an extraordinary risk crime that is subject to the modified sentencing range specified in section 18-1.3-501(3). (c) Nothing in this section shall preclude the ability of a municipality to enact concurrent ordinances. Any sentence imposed for a violation of this section shall run consecutively and not concurrently with any sentence imposed for any crime which gave rise to the issuing of the protection order. (3) (a) Whenever a protection order is issued, the protected person shall be provided with a copy of such order. A peace officer shall use every reasonable means to enforce a protection order. (II) The restrained person has been properly served with a copy of the protection order or the restrained person has received actual notice of the existence and substance of such order. (c) In making the probable cause determination described in paragraph (b) of this subsection (3), a peace officer shall assume that the information received from the registry is accurate. A peace officer shall enforce a valid protection order whether or not there is a record of the protection order in the registry. (d) The arrest and detention of a restrained person is governed by applicable constitutional and applicable state rules of criminal procedure. The arrested person shall be removed from the scene of the arrest and shall be taken to the peace officer’s station for booking, whereupon the arrested person may be held or released in accordance with the adopted bonding schedules for the jurisdiction in which the arrest is made, or the arrested person may be taken to the jail in the county where the protection order was issued. The law enforcement agency or any other locally designated agency shall make all reasonable efforts to contact the protected party upon the arrest of the restrained person. The prosecuting attorney shall present any available arrest affidavits and the criminal history of the restrained person to the court at the time of the first appearance of the restrained person before the court. (e) The arresting agency arresting the restrained person shall forward to the issuing court a copy of such agency’s report, a list of witnesses to the violation, and, if applicable, a list of any charges filed or requested against the restrained person. The agency shall give a copy of the agency’s report, witness list, and charging list to the protected party. The agency shall delete the address and telephone number of a witness from the list sent to the court upon request of such witness, and such address and telephone number shall not thereafter be made available to any person, except law enforcement officials and the prosecuting agency, without order of the court. (4) If a restrained person is on bond in connection with a violation or attempted violation of a protection order in this or any other state and is subsequently arrested for violating or attempting to violate a protection order, the arresting agency shall notify the prosecuting attorney who shall file a motion with the court which issued the prior bond for the revocation of the bond and for the issuance of a warrant for the arrest of the restrained person if such court is satisfied that probable cause exists to believe that a violation of the protection order issued by the court has occurred. (5) A peace officer arresting a person for violating a protection order or otherwise enforcing a protection order shall not be held criminally or civilly liable for such arrest or enforcement unless the peace officer acts in bad faith and with malice or does not act in compliance with rules adopted by the Colorado supreme court. (6) (a) A peace officer is authorized to use every reasonable means to protect the alleged victim or the alleged victim’s children to prevent further violence. Such peace officer may transport, or obtain transportation for, the alleged victim to shelter. Upon the request of the protected person, the peace officer may also transport the minor child of the protected person, who is not an emancipated minor, to the same shelter if such shelter is willing to accept the child, whether or not there is a custody order or an order allocating parental responsibilities with respect to such child or an order for the care and control of the child and whether or not the other parent objects. A peace officer who transports a minor child over the objection of the other parent shall not be held liable for any damages that may result from interference with the custody, parental responsibilities, care, and control of or access to a minor child in complying with this subsection (6). (b) For purposes of this subsection (6), “shelter” means a battered women’s shelter, a friend’s or family member’s home, or such other safe haven as may be designated by the protected person and which is within a reasonable distance from the location at which the peace officer found the victim. (7) The protection order shall contain in capital letters and bold print a notice informing the protected person that such protected person may either initiate contempt proceedings against the restrained person if the order is issued in a civil action or request the prosecuting attorney to initiate contempt proceedings if the order is issued in a criminal action. (c) The defendant was given reasonable notice and opportunity to be heard. (9) A criminal action charged pursuant to this section may be tried either in the county where the offense is committed or in the county in which the court that issued the protection order is located, if such court is within this state. You should be careful to make a responsible choice in selecting a Colorado Criminal Defense Lawyer – and we encourage you to “vet” our firm. Over the last 30 plus years – by focusing ONLY on Colorado criminal law – H. Michael has had the necessary time to commit to the task of constantly updating himself on nearly every area of criminal law, to include Colorado criminal law and procedure and trial and courtroom practice. H. Michael works hard to get his clients the best possible results in and out of the courtroom. 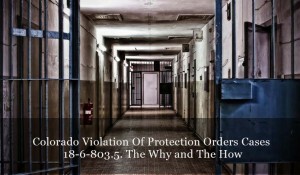 He has written, and continues to write, extensively on Colorado criminal law and he hopes this article helps you in some small way – Colorado Violation Of Protection Orders Cases -18-6-803.5. The Why and The How.